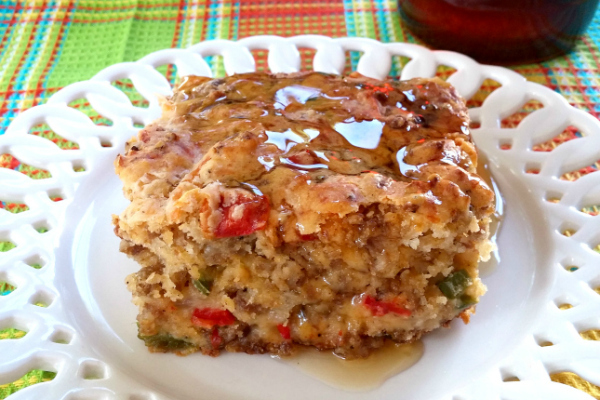 The ORIGINAL Southern savory breakfast cake loaded with sausage, onions and peppers then served with hot maple syrup. The first time I tasted this I wanted to shove my whole face in my plate and eat it like I was the defending champion at a pie eating contest. I found this recipe in an old church cookbook that looks to be at least 40 years old. It's missing the cover or I'd tell you where it's from. I buy these old cookbooks at yard sales and the flea markets so I think there's a good shot it's from somewhere here in South Carolina. The little blurb that accompanied the recipe read that is was the "original biscuit version". I wasn't sure what that meant but I knew I wanted to try it! I didn’t know what to expect. I mean, I love sausage and I like it when syrup gets all over it when I’m having pancakes so I thought meh, I’ll try it. What I didn’t know is what a perfect storm all the ingredients were going to be! The peppers (which I’m not always a huge fan of) work with the sausage and syrup like some culinary miracle. And then when you drench it all in hot maple syrup? Lord, have mercy! 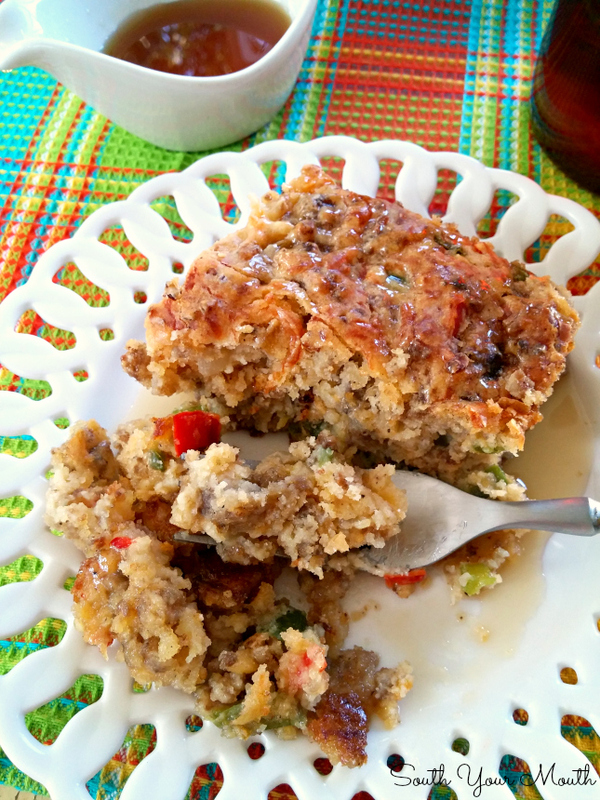 This is a savory cake (a little like a biscuit) chocked full of sausage cheese, onions and peppers. I usually use hot sausage because I like a little heat with my sweet but use whatever you like best! And what made this batch the best I’ve ever had is that my dear friends, Margie and Bob, brought me a big bottle of real-deal pure Canadian maple syrup that Bob’s brother bottles himself. I have never had maple syrup this thick and flavorful – it was like liquid gold!! I'm one of those weird people who like their scrambled eggs to get a little syrup on them when I'm eating pancakes so I love to serve this with a big ol' skillet of scrambled eggs and then get really loosey goosey when I'm pouring on the syrup! Spray a 9x9 baking pan with cooking spray; set aside. Cook and crumble sausage, onions and peppers in a large skillet until sausage is cooked through then remove from heat. Allow to cool for at least five minutes. Combine cheese, egg, salt, pepper and garlic in a small bowl then add to sausage mixture and stir well; set aside. Add biscuit mix, milk and sour cream to a large bowl and stir until combined. Add sausage mixture to dough mixture and stir until all ingredients are evenly combined. Spread batter into prepared pan and bake at 350 degrees for 40-45 minutes or until golden brown. 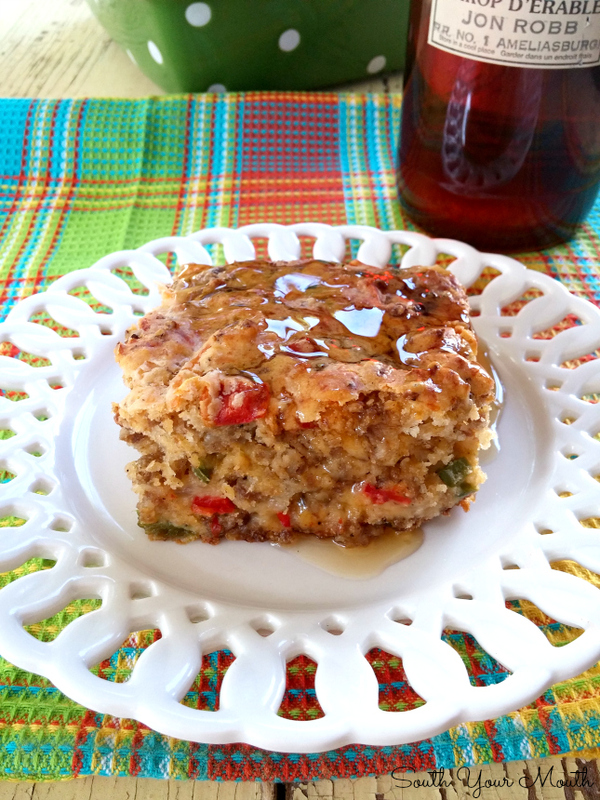 Cut into squares then drizzle with hot maple syrup to serve. Definitely serve this hot. If you need to, reheat servings in the microwave for about 15-20 seconds. This recipe doubles beautifully in a 13x9 pan. This looks so yummy and different! I can't wait to try it. Your description sold me!! I'm making this soon... and I'll be using my homemade Chorizo for the sausage. Can't wait. Made this yesterday. Amazing. If you like bites of pancakes, sausage and syrup together, this is like the adult version of that - on steroids. I made the party shrimp and the breakfast cake Saturday for my "Sister Day" get together. Both were a huge hit!!! No one could stop eating the breakfast cake. 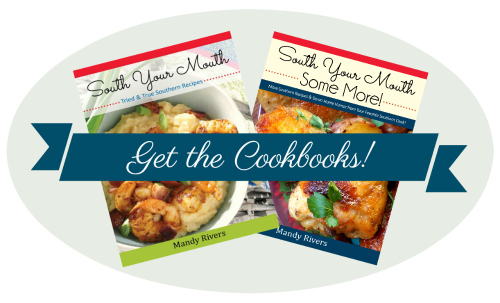 Love your recipes and your cookbook! Can you make this the night before and refrigerate ? Sure :) I don't think it will be as good in the same way a hot biscuit is always better fresh out the oven. Make a Breakfast strata with the same ingredients using bread in place of Biscuit mix and you can have it sit overnight! I don't care for sausage and it does not care for me. Could you use bacon? Also - we used to bring home gallons of pure maple syrup from upper New York state when I was growing up. Cannot stand anything but pure maple syrup....it is wonderful! This was great. I made a few modifications though. I left out all of the peppers, used maple flavored sausage, and put milk gravy on it. It was fantastic. A keeper for sure. I love maple syrup. So, I will try this out! Thanks for sharing this to us! Hey Mandy, does Bob's brother happen to have a site where his syrup could be purchased and shipped? There is not always pure maple syrup available where I am, and I would love to have the real deal for this recipe! Thank you! You make me impressed. You know sometimes I want try some new recipe to breakfast. I go to work and eat in my car. In a weekend I really really want to cook something have a good taste. And I will try this recipe. Look so delicious! Wow!!!!! I made this recipe yesterday and LOVED it!!!!! 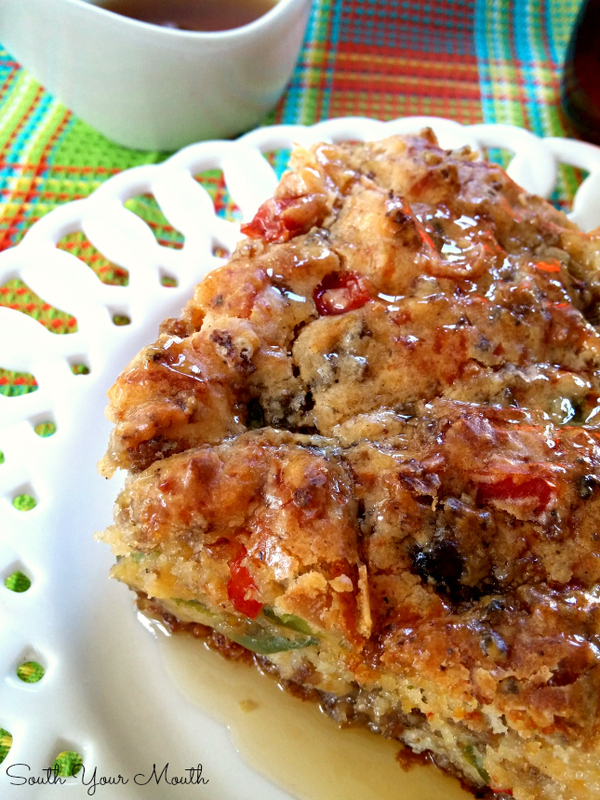 Thank you SO much for sharing this amazing one-of-a-kind recipe! YUM!!!! It is a keeper! OMG...this has my Hubs name all over it...gonna get made tomorrow!! I can't wait to try this! My family will love it! Have you tried doubling the recipe? I'm thinking of this for a crowd on Christmas morning! Thanks! Has anyone doubled this? Does a double batch fit into a 9x13 pan? My nephews would love this for Christmas brunch (and I'm not even sure a 9x13 pan would feed 7 hungry boys).